“We owe it to ourselves and our communities to grow our digital revenues, in order to sustain quality journalism in our societies,” says Lena Samuelsson, Publisher and CEO of Aftonbladet. This Swedish tabloid, owned by Schibsted, was one of the very first newspapers in the world to introduce a paywall in 2003. Since that launch, their digital subscription base has grown to an impressive 250.000. “I don’t talk about content, I talk about journalism, which is the reason why people are paying us,” states Peter Wolodarski, Editor-in-Chief and Publisher at Dagens Nyheter. 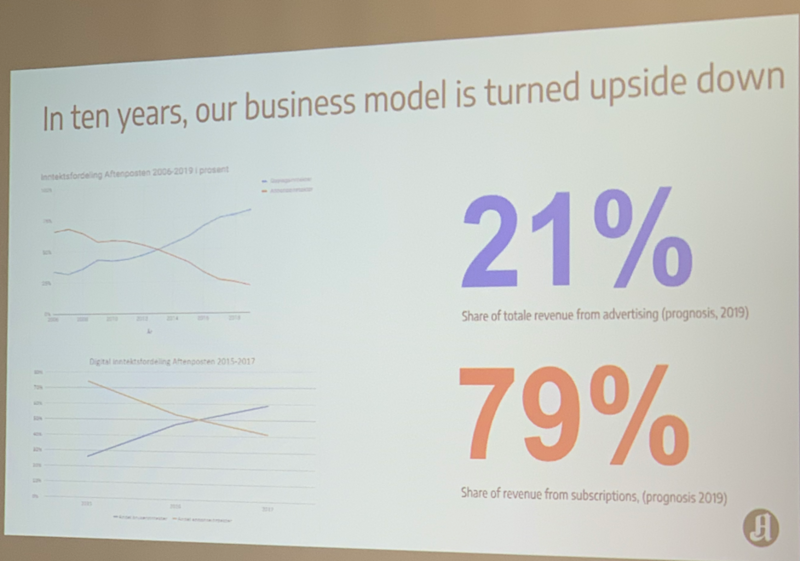 “7 years ago, 70% of our income originated from advertising, today 80% from subscriptions”. Espen Egil Hansen, CEO of the Norwegian quality newspaper Aftenposten, is proud of the results of the ongoing transformation in a highly disruptive landscape. For journalists, this transition is great. “Journalism is finally the product that we sell, in the past we were rather carriers for the advertisers”. This bring us to the first key lesson of the week: these publishers have put enormous efforts in measuring and improving the quality of their digital stories. The team at Norway’s largest digital news destination VG, led by publisher Gard Steiro, have a special motto: “Great stories need to be bacon coolers.” It should be so compelling that it prevents you from eating your breakfast bacon while it is still warm. In order to achieve this, Tone Tveøy Strøm-Gundersen, Managing News Editor of Aftenposten, stressed the fact that the best stories are human centric, relating to the personal lives of the readers or highlighting substantial changes in society. Viktoria Hallberg (Aller Media), Alexandra Beverfjord (Dagbladet), and Anna Careborg (Svenska Dagbladet) also use a framework to organise the categories of stories and their purposes (from conversion to traffic). Scandinavian publishers are embracing data in everything they do. During our visit to Expressen, we were literally overwhelmed by the 280 screens present all over the place, and displaying data about a broad range of topics. In order to make the data more actionable, the various reports and dashboards are introduced by concrete questions: which articles are most converting? How good are we doing versus our goals? Which articles lack images? The team at Expressen, including Head of Commercial Dan Edström, Editor-in-Chief Thomas Mattsson, and CMO Josefina Rickardt, have defined a vision that every member of the newsroom should become data literate, under the slogan “300 data analysts in our newsrooms”. Norwegian quality daily Aftenposten is also using data to redesign its front page. The objective was to be able to cater for various reader types: from the casual reader, who would probably only visit the site a couple of times a week, up to the news junkie, who visits the front page multiple times a day.On the front page, the first 3-5 articles are chosen by the editorial team. The other positions are filled by a new algorithm. The algorithm will choose articles from 5 categories and personalize this to the needs and interests of the readers: news, “surprise me” articles, what others are reading, what converts well, and what performed well past 90 days. Early results of the new front page are very encouraging: a 10-15% increase in stories read, conversion at par with the situation before and more users are exposed to a higher number of the best stories. Other publishers are using intelligent algorithms to determine which stories will only be offered for subscribers. One of the most advanced implementations is done by Dagens Nyheter. Martin Johnson, Head of Editorial Development, explain that every story is first offered for free to all readers. As soon as the engagement of a story on the website or on social channels passes a certain threshold, it will be locked, and only available to subscribers. Most publishers see much higher churn rates on their digital subscriptions than what they see on their print subscriptions. With different degrees of sophistication, most of them have implemented specific marketing retention and win-back programs. In-app communication is key, and readers are offered extra goodies to consider to stay. Dagens Nyheter has brought in an outside firm to use sophisticated data analyses across a wide variety of sources. 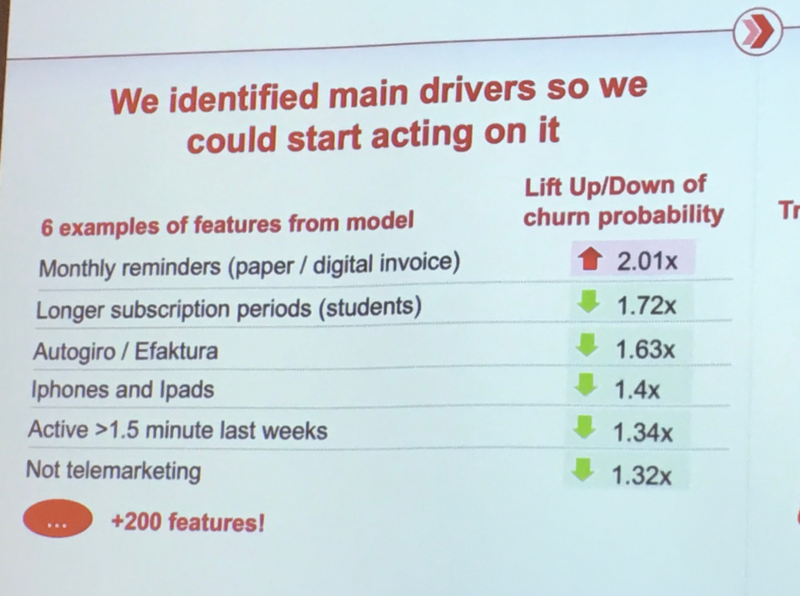 “Our high churn rate was strongly correlated with us sending monthly invoices to our subscribers,” recalls Peter Wolodarski. With the help of McKinsey, and by introducing cross-functional teams, Peter and his teams managed to get the monthly churn rate below 8%. Robin Govik, Chief Digital Officer of MittMedia, also reported similar churn rate numbers. Putting the best journalistic content behind the paywall, and fostering recurring visits, has shown significant impact on churn reduction at this regional publisher. Other publishers, such as Dagens Nyheter, reported that their ePaper subscribers were much more loyal than their other digital subscribers, with a lower churn rate. This is a definitely an interesting segment, and further exploration is required to see if some of the digital subscribers could be moved up to an offering including the digital edition. Finally, Yasmin Namini, former Chief Consumer Officer of The New York Times, noted that European publishers are reporting churn, while American publishers use retention as their key metric. Could it be that a more negative metric as churn increases management attention more than the positive metric of retention? We’ll explore this question as well in a future article on churn. This entry was posted in Industry news and tagged digital subscribers, Events, inma, subscriptions. Bookmark the permalink. ← Are you developing your paywall strategy for acquisition or retention?